The Aussies were bowled out in 46 overs for just 212 as England, led by Graeme Swann's 4-37, excelled on the field. England then collapsed from 185-3 in the 42nd over to 203-9 but Tim Bresnan kept a cool head to seal the win. Victory did not look remotely in doubt while Andrew Strauss and Eoin Morgan were in the midst of a 57-run stand off 69 balls for the fourth wicket. But Strauss, who played in orthodox fashion throughout to make 87, and Morgan (27) were parted when the latter miscued his pull shot off the leg-spinner Steve Smith to be caught at short midwicket in the 42nd over. England still had six wickets in hand to knock off the remaining 28 runs needed, but somehow they made it as hard as possible - though there was also some fine reverse swing at pace to contend with from Shaun Tait (3-28) and Doug Bollinger (3-20). Strauss nicked Ryan Harris to wicketkeeper Tim Paine, before Luke Wright attempted to clear long-off before he had got off the mark, merely providing an easy catch to the fielder to give Smith a third wicket. 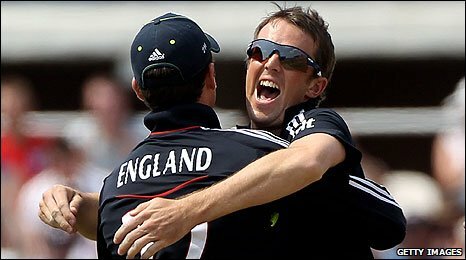 Michael Yardy played more solidly until edging Tait behind, and then Bollinger struck twice in his final over, clean bowling Graeme Swann and then Stuart Broad. With 10 needed from the last two overs and only Bresnan and James Anderson left at the crease, Australia had gone from no-hopers to favourites. But Ricky Ponting had used up his best bowlers, and with the batting powerplay in force until the very end, he could have only three fielders outside the circle. With tension gripping the packed crowds at a sun-kissed Old Trafford, there was a huge sigh of relief when Bresnan finally swung Harris lustily over cover for four and scrambled a single with seven balls remaining to take the strike going into the final over, bowled by James Hopes. England needed three to win, and Bresnan leaned back to carve Hopes's first ball through the vacant slip and third man area for the winning boundary. On the same day that the national football team had crashed out to Germany in the World Cup, English sports fans had a significant victory in the world of cricket to celebrate instead. This was both England's first success in a head-to-head series against Australia since the 1997 Texaco Trophy, and their eighth ODI success on the bounce. England hold the Ashes, are ICC World Twenty20 champions and also appear to have hit on a winning formula in the 50-over game - and their recent good form in this format comes with the World Cup just eight months away. 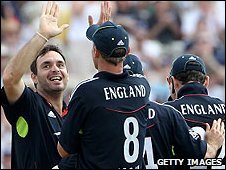 Strauss won his first toss of the series, and after successful chases at the Rose Bowl and in Cardiff, elected to put Australia in. When no wicket had come in the first 13 overs, Australia, on 75-0, appeared set for something approaching 300. Instead Yardy almost immediately trapped Paine lbw and the shutters were pulled firmly shut. Ponting found scoring tough, and when he skipped down the wicket to Swann in the spinner's second over the Australian captain was surprised by a delivery which turned sharply past leg-stump with Craig Kieswetter completing a sharp stumping. The Australian innings never recovered. Shane Watson (61) tried to nudge Swann into the on-side for one but simply lobbed up an easy catch when more meaty striking might have served him better. Australia still had seven wickets in hand entering the last 17 overs, but Cameron White was unfortunate to middle a sweep shot straight at Strauss, who held a good catch low to the ground, whereupon an out-of-sorts Michael Clarke became Swann's fourth victim. Bearing in mind the success of his slower bowlers, Strauss gave Collingwood a very fruitful five-over burst, and the Durham veteran pulled back from his usual medium pace to something just above slow to take 1-21 with a variety of cutters. James Anderson (3-22), with the help of one Stuart Broad wicket, polished off the rest with a mixture of perfectly-executed yorkers and bouncers. Tait had been plucked out of county duty with Glamorgan to lend some cut and thrust to Australia's depleted bowling line-up and provided immediate evidence that he should have been in from the start when he demolished Kieswetter's stumps in the first over of the chase. But, as Kevin Pietersen (25) and then Collingwood (40) helped Strauss chip away diligently at Australia's target, there appeared to be little prospect of a dramatic conclusion. How wrong we were.